Significant Professional or Academic Accomplishments: Mr. Lorenz Neuwirth began his academic career as a 7th grader in the College of Staten Island STEP program and now is our STEP alum. Since then Lorenz's interest within in behavioral and physical sciences lead him to pursue a bachelor's of Arts degree in psychology, a graduate certification in disability studies, a Master's of Science degree in neuroscience, and a Master's of Philosophy in Biology. 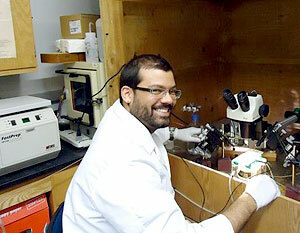 Currently, he is near completion of his PhD in neuroscience in which he will be defending between June and August 2013. Upon his completion of his PhD he is looking to obtain a post-doctoral position in academia to mentor underrepresented groups within the STEM fields. Lorenz is a true success of what access programs (i.e. STEP and CSTEP) provide for historically underrepresented students pursuing careers in the STEM fields.